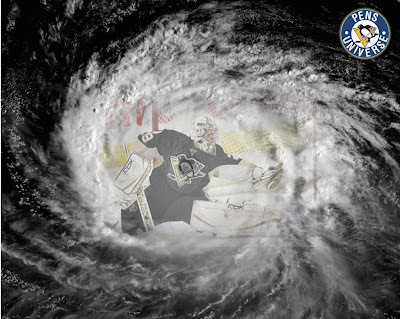 Just as the picture suggests, Fleury was in the eye of the hurricane and weathered the storm. He was the first star in the minds and hearts of all Pens fans. No offense to Boucher or even Geno. But had not Fleury come up big, this game could very well have been out of reach, and early. This game began with the Penguins appearing quite flat. For the first 5 or so minutes of the game was all Canes, but that's not really saying much. The Pens came out and did nearly nothing on their two power plays. Quite honestly there wasn't that sense of urgency you witnessed in the first two series for the Penguins. And being the conference finals that wasn't a good sign. Though at the very second in which the Penguins killed off a Satan penalty, Miro himself caught a breakaway. Looking 10 years younger he beat Cam Ward like a rented mule with a backhand off a deke. That goal by Satan did in fact change the whole landscape of the game. Reason being, just over a minute later after some decent forechecking from the Penguins Geno slipped a hot one past Ward to bring the score up to 2-0. After this the Penguins controlled the remaining minutes of the 1st period. The 2nd period didn't have a whole lot of action on either side of the ice. Ward did rob Guerin about half way through the period. The Pens outshot Carolina 12-6 but it was LaRose who tallied the first goal for the Canes. The third period did have some action to it toward the end. Phillipe Boucher scored a powerplay goal assisted by Crosby and Malkin which proved to be the decisive game winner. In typical fashion the "Cardiac Canes" did their thing toward the end and scored late on a 6 on 4 to pull within one goal with 1:26 remaining. Though it is my contention that goal should have not come to fruition with Eric Staal sliding Fleury's stick away, a clear penalty. Fleury would get his revenge though stopping Staal on a late chance to keep the score 3-2 and head into victory. The game seemed to be a duel between Fleury and Ward. Both came up with some very timely saves and robbed the opposing team several times. Crosby was held to no shots in the first 2 periods and seemed a little out of sync. Carolina's PK was worthy enough to mention. Though I felt the Pens didn't execute well on the first 2, the Canes could have very well been the reason coming with a ton of pressure. Gonchar played 21 minutes but I felt looked a little slow which resulted in some untimely turnovers. Satan has been a delight in this post season. Very much impressed with his play. I wish Sykora would not have slumped, but I'm happy Miro is stepping up at the right time. Ruutu and Cole seemed to have sustained injuries. Not sure of the severity at this point. The knee to knee from Cooke and Cole didn't seem intentional. But that's not my call. I have NO idea why people are questioning Cole's interference call. What? A big man can be knocked off balance? Bottom line, a win is a win. Need 7 more. The Penguins need to come out much more sharper on Thursday and take control of the game early. The two quick goals is what it all about but they can't sit back and feed off of them. They must act with a sense of urgency. The game could have been decided earlier if they got that 3rd goal sooner, before Carolina even scored. If I were Bylsma I wouldn't be very excited about this win. Sure they won but it wasn't their best performance. Crosby needs to be more involved and in my opinion should start on the ice at faceoff to try and create something early; get the Canes on their heals right off the bat. See I thought the Pens role players played well. Crosby did seem a little out of it. But like you say, a win is a win. I'll take a win when Sid and the boys play bad. Works for me.